I’m sure you are backing up your business data already, ”Of course I am” you say, and there could be an eye roll in there too; but if the worst happened… have you tested that back up lately? What is your business continuity plan? How quickly would your business be up and running again, and more importantly how much would that down time cost you? We could have your business up and running again in minutes after a server failure with, not just a backup, but a full replication of your server housed in your office, and if there were a natural disaster, fire etc. and your server and datto box were rendered inoperable, then the full replication of your server in the cloud would keep any business disruption to a minimum. All these enhanced ‘back ups’ are regularly tested and booted up to give you peace of mind. 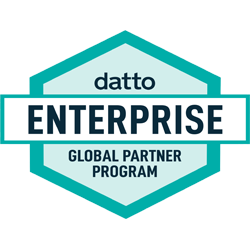 As an Elite datto partner we are perfectly placed to evaluate your needs, supply, configure and manage a datto solution for you. Contact us today– we offer a no obligation consultation. Call our friendly team on 01865 989144. Datto BDR hardware allows you to instantly restore accounts and data so you can continue with business as usual in any crisis. claireLOGIC offers a range of Service Desk and Onsite Support options to help deliver the Datto promise. Not every business requires an IT department in-house – but almost all businesses can benefit from the IT support and knowledge we provide. Whether it’s keeping an eye on your data security, explaining why your internet is down and fixing it, through to monitoring your server storage space – we take the headache of all that technical stuff off your hands. At claireLOGIC we work with our eyes and ears open. If we come across frustrations that we have solutions for we’ll talk to you about our ideas. We’re not the kind of business that comes in with a job sheet and ignores everything else. We invest in the best management and professional services automation software. This allows us to work accurately and efficiently ensuring that your needs are always met.